You can make an eye blink by creating a blink symbol. 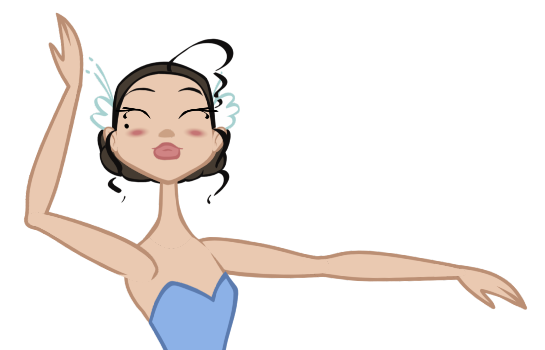 Here is an example of a blinking animation created in a blink symbol. 1. In the Library view's right side,right-click and select New Symbol. 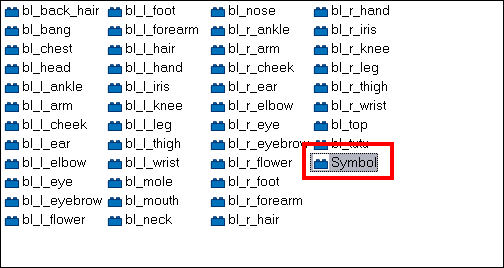 The new symbol appears in the Symbol library. Animate Pro then automatically enters the symbol so you can edit it. 3. 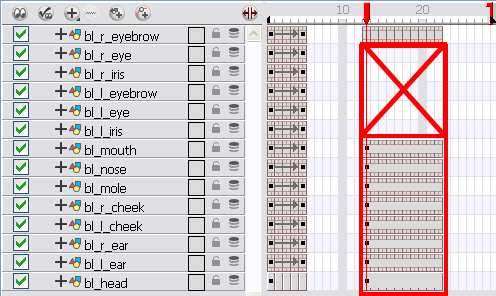 Drag the eyes, pupils and eyebrows symbols or template from the Library view to the Timeline view's left side. If you do not already have your eyes, pupils and eyebrows in your library, you should create either symbols or templates out of them. 4. In the Timeline and Camera view, animate the blink. 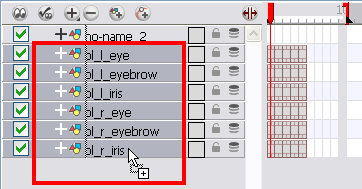 ‣ If you enter the eyelid or eye symbol to add more drawings, they will be added into each instance of that symbol. If you modify the exposure of the eye symbol within the Blink symbol, it will not be modified in the other instances. 5. In the top menu, select File > Save. 6. In the Camera view's top area, click on the Top button to go back to the scene's timeline. 7. In the Tools toolbar, select the Transform tool or press [Shift] + [T]. 8. 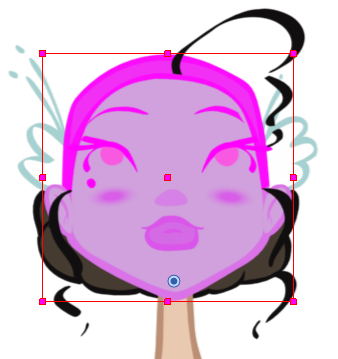 If your head is a symbol containing all the facial feature symbols in the Camera view, double-click on the head's symbol to edit it. 9. From the Library view, drag the new Blink Symbol and drop it into one of the eye feature layers. Before dropping the symbol in the Timeline, hold down [Alt] (Windows) or [⌘] (Mac OS X). 10. Drop it into a series of blank frames. Do NOT drop it where there already is an exposure. 11. 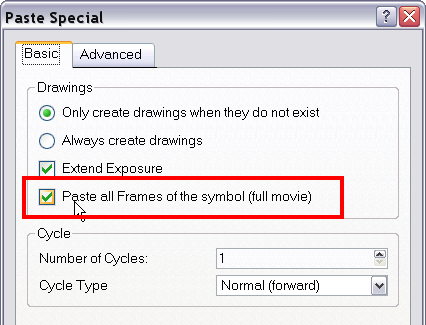 In the Paste Special dialog box, enable the Paste All Frames of the Symbol (full movie) option. 13. In the Timeline view, expose the other facial features and head drawings. 14. If you are editing the head symbol and not dropping the new symbol into the main timeline, click the Top button to go back to the root timeline. 15. To expose the blink frames you just inserted inside the head symbol, in the Timeline view, select the head layer's cell range where you want to expose the blink. 16. 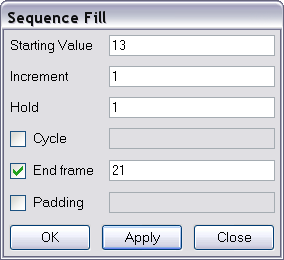 In the top menu, select Animation > Cell > Sequence Fill or press [Ctrl] + [M] (Windows) or [⌘] + [M] (Mac OS X). 17. In the Starting Value field, type the fist frame number where you exposed your blink inside the head symbol. 18. In the Hold field and Increment field, type "1". 19. If necessary, type the frame number on which your want the system to stop exposing the symbol. 20. Click on the OK button. You can create walk cycle animation symbols or head turn animation symbols and drop them directly into your main timeline in any drawing layer.